The origins of the sash reflect the diversity of the Métis experience. The finger-weaving technique used to make the sash was firmly established in Eastern Woodland Indian Traditions. The technique created tumplines, garters and other useful household articles and items of clothing. Plant fibers were used prior to the introduction of wool. Wool and the sash, as an article of clothing, were introduced to the Eastern Woodland peoples by Europeans. The Six Nations Confederacy, Potowatami and other Indian nations of the area blended the two traditions into the finger-woven sash. The French settlers of Québec created the Assomption variation of the woven sash. The sash was a popular trade item manufactured in a cottage industry in the village of L’Assomption, Québec. The Québécois and the Métis of Western Canada were their biggest customers. Sashes were also made by local Métis artisans. Sashes of Indian or Métis manufacture tended to be of a softer and loose weave, frequently incorporating beads in the design. The sash was used by the Métis as a practical item of clothing. It was decorative, warm and could be used to replace a rope to tumpline if none were available. The sash has been the most persistent element of traditional Métis dress, worn long after the capote and the Red River coat were replaced by European styles. The Métis share the sash with two other groups who also claim it as a symbol of nationhood and cultural distinction. It was worn by Eastern Woodland Indians as a sign of office in the 19th century. It was worn by French Canadians during the Lower Canada Rebellion in 1837. It is still considered to be an important part of traditional dress for both of these groups. The sash has acquired new significance in the 20th century, now symbolizing pride and identification for Métis people. Manitoba and Saskatchewan have both created "The Order of the Sash" which is bestowed upon members of the Métis community who have made cultural, political or social contributions to their people. The sash is one of the most recognized garments worn by the Métis. Traditionally, the sash or calenture flechee was worn by men, but today it can be seen on both genders either tied at the waist or draped across one shoulder. The sash can come in many different colour variations, and in the past certain colours and patterns were used to identify specific families from various communities.  Red – Is for the blood of the Métis that was shed through the years while fighting for our rights. Blue – Is for the depth of our spirits. Green – Is for the fertility of a great nation. White – Is for our connection to the earth and our creator. Yellow – Is for the prospect of prosperity. Black – Is for the dark period of the suppression and dispossession of Métis land. Originally the sash was used for back support for the voyageurs that traveled the fur brigade trails. It was a belt that was finger woven and had fringe that hung down on either end. Some of the uses for the sash included a tie for a capote, a harness for carrying materials, and a washcloth or towel. The fringed ends were used as thread for an emergency sewing kit. Although the fur trade days have long ended, the sash still remains an important symbol for the Métis and is often presented as a gift to both Métis and non-Métis people. The sash has been the most persistent element of traditional Métis dress. The Métis 'share' the sash with two other groups who also claim it as a symbol of nationhood and cultural distinction.